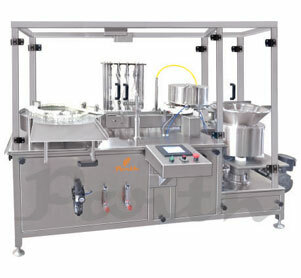 The Vial filling & rubber stoppering machines are required for pharmaceutical and other industries as a packaging solution since the vials need to be properly stored. Parth Engineers & Consultant supplies injectable vial filling & rubber stoppering machine in different variants catering according to the requirements. We offer Automatic 12/8/6/4-head vial filling machine & stoppering machine model. The injectable vial filler and capper machine is designed to extract maximum productivity from it and can be tuned up as well. The industrial graded raw materials provide a sturdy structure making the vial filling machine durable for a longer period of time with the stainless steel enclosure adding core to its rigidity. The injectable vial filler and rubber stoppering machine is made compact and is quite a user-friendly with easy to operate and maintain.